﻿ For Ahn Jeju Pension, Jeju Island | FROM $38 - SAVE ON AGODA! "Good hotel for Hyeopjae Beach, nice sea view." Have a question for For Ahn Jeju Pension? "The room size is bigger than expected, receptionist is friendly, and got a super nice sea view." "We stayed for three nights in For Ahn Pension and enjoyed everything, especially the warmth and hospitality of the host family." "Our room in the 4th floor was top clean with brilliant ocean views." Conveniently located in Jeju Island, For Ahn Jeju Pension is a great base from which to explore this vibrant city. From here, guests can enjoy easy access to all that the lively city has to offer. Also within easy reach are Hyeopjae Beach, Hyeopjaegul Cave, Hallim Park. At For Ahn Jeju Pension, every effort is made to make guests feel comfortable. To do so, the hotel provides the best in services and amenities. The hotel offers access to a vast array of services, including free Wi-Fi in all rooms, convenience store, laundromat, kitchen, express check-in/check-out. The hotel features 10 beautifully appointed guest rooms, many of which include television LCD/plasma screen, internet access – wireless (complimentary), air conditioning, heating, refrigerator. The hotel's recreational facilities, which include golf course (on site), karaoke are designed for escape and relaxation. For Ahn Jeju Pension is a smart choice for travelers to Jeju Island, offering a relaxed and hassle-free stay every time. "The old lady is very hospitable." We stayed for one night as we were touring around Jeju Island, and would have loved to stay longer. The downside is that there is no lifts, so we have to carry our luggage up the stairs to our room on the third floor. However, Gloria and her mum (the host) were very warm and friendly. Gloria messaged us to check if we have problems locating the pension, and we were touched when breakfast was served to us in our room. Will definitely recommend this place, and consider staying here again on our next trip. Good hotel for Hyeopjae Beach, nice sea view. I was there for 2 nights. The hotel itself was fine. The overall design can be better. Family who runs it were really helpful and friendly. They gave me a bike and help me on navigating. Okay place but not lifts and was hard to heat the room up. Nice people thought! The pension was situated along a road, you got to go through a small side road. Along the way in, there was a small eatery which we had dinner before checking in. Just a stone's throw away, there is a cafe and another restaurant, so food should not be an issue. However, be prepared to carry your luggage up the stairs as there is no elevator. Overall is good! The room size is bigger than expected, receptionist is friendly, and got a super nice sea view. Only bad is that don't have lift! Has many tourist spots nearby. The old lady is very hospitable. We stayed for three nights in For Ahn Pension and enjoyed everything, especially the warmth and hospitality of the host family. Our room in the 4th floor was top clean with brilliant ocean views. The daily breakfast was superb and the coffee excellent. 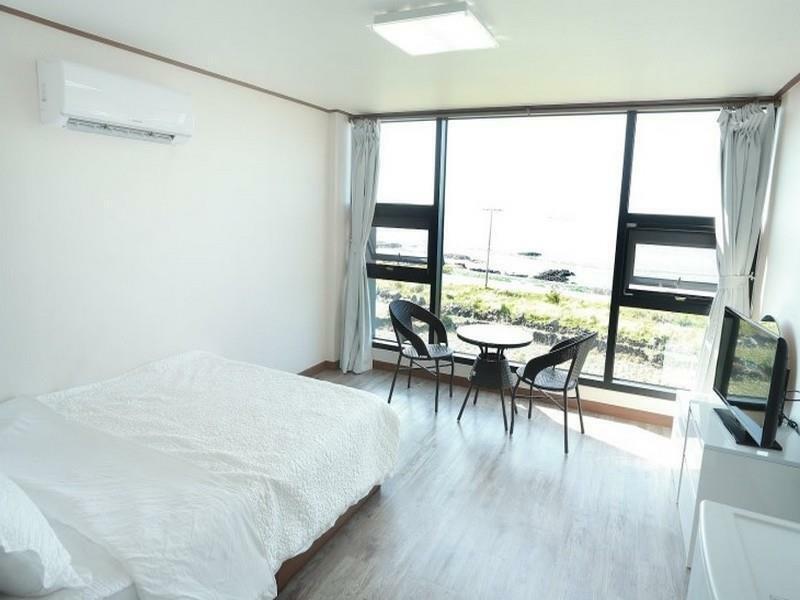 The accomodation is only a short ten minutes walk away from beautiful Hyeopjae Beach. At the end we even got a lift to the next bus stop. We would definitively return and recommend this place. Nice pension at the shoreline. Currently being expanded. To beach, please allow 15 minutes of walking on main road. Rating of this place is tricky, on the one hand a nice place but keep in mind it is a pension and and not a hotel and one is getting a corresponding standard. We had a great time in Jeju and For Ahn Jeju was one of the reasons why we had such a lovely time in Jeju! We really did not want to leave and are still talking about our time in Jeju. As a Korean, I wad very proud that we still have many kind people and beutiful nature. We will definitely visit again in the summer. Thank you! Good view, well arranged studio but too noisy for 2 reasons : 1/ the walls are very thin so you listen the other rooms. 2/ a building is under construction very close to the pension so wake up at 07 : 00 am ! Our stay was pleasant, the staff was extremely nice and helpful, they gave us two bicycles to go around which I strongly recommend because it's relaxing and you can really visit the area better, it's a bit isolated so it's necessary to have some sort of transportation. Hyeopjiae beach is near to reach by bike , better choose to stay on the side of it because the center is very crowded, in august it's low tide starting from 2pm so in the afternoon it's easier to get some isolated spots on the sand, and the seaside is surprisingly really beautiful with white sand and crystal clear water. The girls were really helpful and attended to our needs and well spoken in English. She even helped us plan and organize our full day outing and arranged the taxi for us. Even while we were out, she called to check on the taxi for us and texted us to see how we were doing. Overall, I really enjoyed my stay here and their service and would definitely come back again! extremely friendly, pleasant and helpful staff. Two daughters who can speak good English are very helpful and very good company. Smiles are everywhere. The pension is bran new done very tastefully and with high quality, practical and very clean. New cafee and restaurant are just being build attached to the pension. Location is the best from this part of the beach (quite but not far from the happenings) with charming sea view. Each room is facing the sea. Highly recommended!! The pension is actually a bit far from the seaside, 200m? The best was the ocean view from our room and the friendly family staff. We are Americans who speak little more than hello and thank you in Korean, so the fact that the family owners went out of their way to communicate (their English was also limited) and give us the information of the local area was very impressive. We didn't have our own transportation either and they helped with that including offering to take us somewhere I specifically asked about. I was anxious about what bedding they would provide for my 5 year old son since I knew he'd be sleeping on the hard floor and there are no rooms with a sofa or extra rollaway beds. They gave us a nice soft mat, warm blanket, and pillow and that was perfect! We walked the short distance to the beach and several little coffee shop/restaurants in the area on the same road. We found those on our own just walking around and the western food they serve is awesome! We do enjoy Korean food but the one place we went that was famous in jeju for seafood just down from our hotel left much to be desired, but maybe that's just us not the restaurant. They are currently building a coffee shop directly in front of the guesthouse which did not block our room view but we could hear construction going on in the morning. It wasn't bad but noticeable and unavoidable. I'm sure when it's completed it will be an even better guesthouse. Our bed was a Korean bed but not as hard as some Korean beds we've had to sleep on. The bathroom had no shower curtain or divider to bathe so the floor gets all wet and it would be nice if they installed some hooks to hang up your clothing. They provide small towels and it was enough and we hung out our swimsuits and our own beach towels on the coat hanger that was there by the window. The window view is as great as it looks on the website pictures! There was English TV cable channels so that was nice too. Overall, we really liked it and would definitely stay there again!